Sharing rituals with our kids throughout the year. Rosh Hashanah, the Jewish New Year, is observed this week. As we do every week, Michael and I plan to bring Muffin and Squeaker to synagogue. We hope they enjoy the special rituals of the holiday, as we have tried from the very beginning to integrate the girls into our religious life. We want them to have the same connection to our faith and our ritual that Michael and I have. We first brought Muffin and Squeaker to our synagogue, Congregation Kadimah-Toras Moshe in Brighton, when they were six days old. We’d been home from the hospital for less than 48 hours, but both Michael and I felt that if we were all feeling up to it, we should all be present at the girls’ naming ceremony. The girls were, as should be expected, unaware of most of what went on around them. I like to think, however, that they were aware of being the center of attention, as people kept coming up and looking at them as they slept in their stroller seats. Since then, we’ve been incorporating the girls into all of our religious life, to the level that is appropriate for their age. We give them the traditional blessings for children every Friday night at the beginning of Shabbat, the Jewish Sabbath, and they sit with us for the religious rituals before Friday night dinner and Saturday lunch. When Shabbat began later during the summer as sunset came later, we adapted to accommodate the girls bedtime. As long as we could, we started Shabbat early so that the girls could continue to participate in the ritual. But once sunset got so late that we couldn’t justify keeping the girls awake for the beginning of Shabbat, we made sure to give them their blessings right before bed so that they still knew it was something special. As each holiday came, the girls learned what they could, at their level, about the holiday. The first year, they didn’t get much out of each one. 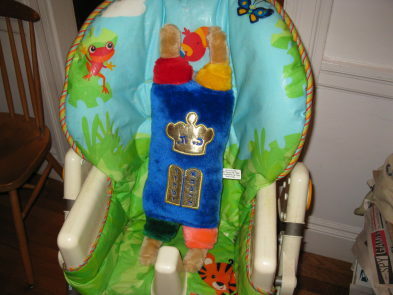 They were two months old for their first Rosh Hashanah, and I have a vivid memory of Squeaker staying fast asleep during the loud blasts of the shofar, the traditional ram’s horn blown on Rosh Hashanah. Last year, both Squeaker and Muffin were startled by the shofar blasts, so this year, at a friend’s suggestion, Michael started showing the girls video recordings of shofar being blown so that they will be ready for it this year. (It’s astonishing what one can find on YouTube.) Also, last year was the first time we offered Muffin and Squeaker apples dipped in honey, symbolic food for a sweet new year. They were a little confused by the uncommon combination. This year I hope they will enjoy the treat more. The fall holidays continue with Yom Kippur. Their first year, we asked our regular babysitter to watch the girls during the day. The girls were too young to spend all day in synagogue, and since they were obviously not fasting due to their age the babysitter would be able feed them at appropriate times. When the holiday falls on the weekend, as it does this year and did last year, I stay home and observe the holiday as best as I can while still providing for the girls’ needs. The next holiday is Sukkot, during which we live as much as possible in temporary booths called sukkot (the singular of which is sukkah). Michael and I traditionally spend the beginning of the holiday with my parents, as they have space to build a sukkah, and then spend the rest of the holiday eating in the sukkot of friends. On their first Sukkot, the girls slept through the first meal we ate in the sukkah, but they enjoyed looking around as we ate outside for the first time in their lives. Their second Sukkot, they enjoyed eating outside and running around my parents’ backyard, but I don’t think they understood the significance of any of it. This year, however, they are much more engaged with their surroundings, and they are learning about Jewish holidays in their playgroup, which is run by one of the members of our synagogue. The last Jewish holiday of the fall is Shmini Atzeret and Simchat Torah. On Simchat Torah, we finish the cyclic reading of the Torah and start again, and we celebrate this with singing and dancing. There is a tradition that all children get called to the Torah during the day on Simchat Torah, and Muffin and Squeaker will, we hope, participate in this tradition this year as they did the past two. This year is the first that I think they’ll possibly understand the ritual, as they have seen Michael and others called to the Torah on Shabbat and other Jewish holidays. They may even get an opportunity to dance around the synagogue with their plush Torah toys, connecting them further to the traditions of the holiday. After the fall holidays, we don’t have any big holidays until Passover comes in the spring. The girls, however, have been learning about Chanukah and Purim, the two minor holidays that come before Passover, through books we read to them. Even in the middle of the summer, they enjoy spinning dreidels, the traditional tops associated with Chanukah. With luck, this will give them the background they will need to appreciate the holiday when it comes. Editor’s Note: We published The Brookline Parent column early this week in observance of Rosh Hashanah. This entry was posted in Columns and tagged Raising Jewish kids, Raising kids with traditions, Rosh Hashanah, Rosh Hashanah with kids. Bookmark the permalink.